Monochrome photograph of Dornoch School 1928-1929. Rear row (left to right) Ron Aitken, Adam Grant, ? Mackay, Hamish Sutherland, Duncan Gunn, ? , Innes Grant, ?. Middle row (left to right) John Anderson, John Murray, Rene Munro, Shona McDonald, Alice Ross, Jean Ross, Chrissy McDonald, Olive Will, Donald Mackay, Robert Mackay. Front Row (left to right) ? Sinclair, Jessie Munro, ? Gunn, ?, ? Mackay, ?, Ruby Budge, Jessie Munro, Elise MacLeod. 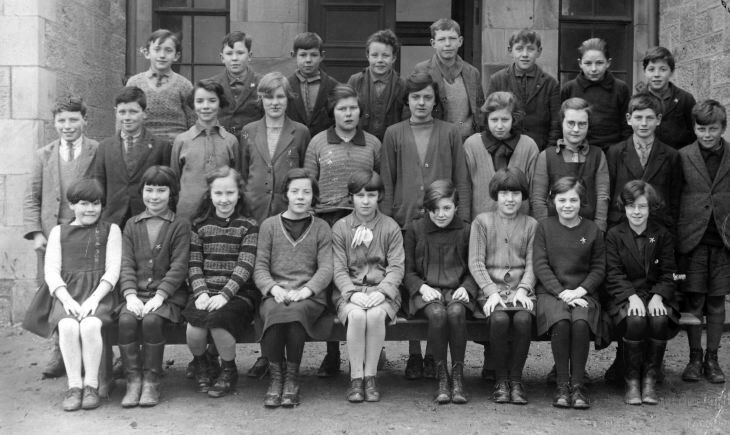 Hello, the boy at the back row, end right, is Harry Sutherland. ~ Thank you for your comment. ~ Administrator.